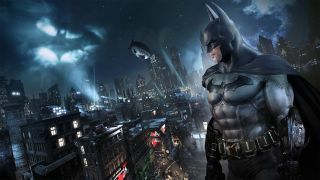 Throughout the history of video games, developers have brought the stars of graphic novels to life and allowed players to live out their super hero fantasies. Whether Spidey gets your senses tingling or Batman is your dark knight in shining armour, here's our list of Xbox gaming's greatest comic book tie-ins. If it wasn’t for Rocksteady’s Bat adventures, Spidey 2’s movie adaptation might just be the best open world superhero game ever. Why is Treyarch’s webbed tie-in so successful? One word: swinging. The web-slinger’s arachnid abilities are mapped to both shoulder triggers and once you get into the rhythm of grabbing and letting go, the huge, seamless New York is an irresistible playground of soaring and stomach-droppingly responsive acrobatics. Add in combat that sees Spidey hanging goons off street lamps, a slew of side missions, and even a citizen that shouts “hey, webhead!” on your way past and this is a true classic. Yep, you can print that in The Daily Bugle. Michael Bay is responsible for an awful lot of therapy bills for what he’s done to ‘80s stalwarts the Teenage Mutant Ninja Turtles and Transformers in movie form. But all’s not lost. If anyone could fix the terror Bay has wrought, it’s Bayonetta and Metal Gear Rising devs Platinum Games. Their Devastation is a nostalgia shot in the arm with dizzyingly bright, fast-paced action that looks like it was lifted directly from the ‘80s cartoon. Add in the studio’s signature combo-based combat and real-life surviving original voice actors Peter Cullen and Dan Gilvezan and it’s eye-wateringly good fun. It doesn’t matter who your favourite character is, TT Games’ first bricked jaunt into Marvel territory has them all. There’s plenty of the ‘destroy this, build that’ mentality of the Lego franchise, but it’s so beautifully aligned with heroes’ abilities that it feels as fresh as a daisy sprouting from one of Groot’s organic crannies. While the campaign across the galaxy is fun, it’s discovering the secrets of the huge open world New York that holds the most delights as you hurtle skyward with Iron Man or relentlessly mow down crims as the Punisher. And yes, there are more in-jokes than an episode of Arrested Development. It’s rare that a game manages to pay homage to decades of source material, but Raven Software’s mutant-flavoured Xbox offering gets it just right with an action RPG that has more than a hint of dungeon crawling. The team-based gameplay lets you switch between Wolverine and 14 of his X-pals at will, and while the Ultimate X-Men comics inspired the majority of the costumes, the rest of the lore is taken from across the mutant universe. There’s also the small matter of a classic story penned by a group of former Marvel writers. Smash in juicy combat and the beautiful cel-shaded visuals, and this is as solid as Adamantium. We’ve included all three here because choosing between them is a bit like deciding what to watch on Netflix when someone says “I don’t mind”. Whether your favourite is the more linear Asylum, which dropped our jaws back in 2009 as the Scarecrow tinkered effortlessly with the fourth wall; City, where the dark open world makes you feel truly like the Bat himself; or Knight, where all of Gotham waits to be ground to dust by Batmobile tyres, this caped trilogy is a comic book masterpiece. Toss in Rocksteady’s ultra crunchy combat and exceptional voice performances and this is like a Batarang followed by a fist to the face of lesser tie-ins. Are you sitting comfortably? Then we shall begin. Bill Willingham’s fairy tale-packed Fables graphic novel series makes a perfect translation from panel to screen with the detective adventures of Bigby Wolf. In the heart of Manhattan lies Fabletown, where the whisky is always neat and Snow White and co must blend in with regular humans. Not only easy on the eyes with its comic book visuals, there’s a rollicking murder plot and characters that’ll genuinely warm the coldest of hearts. Hell, the opening neon-flecked credits are worth the admission alone. Further proof that there’s no one better than Telltale to take on an episodic Batman series this year. NetherRealm’s heroic brawler did Bats vs Supes with eye-popping visuals long before Zack Snyder stunk up the joint. Pitting DC welterweight against DC welterweight is a ridiculous amount of fun and there’s a juicy alternate reality plotline with a catastrophically murderous Joker that means everyone’s at each other’s throats. Each of the 24-strong line up, including Wonder Woman, The Flash and Harley Quinn, have their own unique traits, combat is satisfyingly crunchy, and environments have interactive elements that let you throw water-towers, neon signs and even the Bat signal. Commissioner Gordon is going to be pissed. Another comic tie-in that just shouldn’t work, Mr Pilgrim’s adventures to defeat Ramona Flowers’ seven evil exes is a gloriously happy-making side-scrolling beat ‘em up from Ubisoft Montreal. While the nostalgic 16-bit visuals, couch co-op and clear love for all things retro are brilliant fun, the main draw is the spectacular soundtrack from permanently upbeat chiptune masters Anamanaguchi. Get to Spotify and if it doesn’t make you want to snort dust from a NES cartridge, take on a series of beautiful nostalgic environments and put your pixelated fists in faces then you might be a bit broken. Sorry. Insert coin to try again? There’s no shortage of undead apocalypses on Xbox, but none are as heart wrenching and downright grim as this. Bringing the sheer desperation of Robert Kirkman’s zombie-infested nightmare to consoles, this is instantly gripping as you meet Lee, Clem and a ragtag bundle of survivors you’ll become far more attached to than you’d like. Without a single easy choice across the whole game, it’s a good thing that each of the five episodes is only a couple of hours long. The stress, quite frankly, is enough to enforce a prescription of Adventure Time to help you recover. Okay, so it’s only half a comic book tie-in (sue us) but seriously, who doesn’t want to see what happens when you pit Resident Evil’s Nemesis against Iron Man? Still focusing on a tag team of three heroes or villains, this update to the third in the series adds in new characters such as Doctor Strange, Hawkeye and Rocket Raccoon to make sure you can build an even better Guardians of the Galaxy or Avengers roster. S.H.I.E.L.D.’s Helicarrier is a stage, Dark Daredevil makes an appearance and you can chomp through arcade mode as the devourer of worlds himself, Galactus. Who needs twenty more years of the MCU again? Mafia hitman? A hit with the ladies? The powers of an elemental demon force that mean living tentacles with teeth sprout out of his back? What’s not to love about Jackie Estacado? While the original Darkness – based on the comic book series by Marc Silvestri, Garth Ennis and David Wohl – was a demonic whale of a time, it’s the second first-person gorefest that takes the biscuit. If by biscuit you mean removing spines rectally, slicing foes in half with tentacles, popping heads off enemies like corks from stoppers, and yanking beating hearts out through mouths. And if that is what you mean by biscuit, we ain’t ever having you round for tea. Everyone remembers Manhunt 2’s ratings controversy, but Frank Castle’s comic adaptation had an equally rough ride with the BBFC. It was one of the only games slapped with an Adults Only rating in the US, and in the UK it was rejected entirely until additional solarising and zoom effects were added for the ‘special interrogation’ sequences. Totally in keeping with the comic’s brutal atmosphere and Castle’s unrelenting quest for his brand of justice, these include crushing heads by closing windows, drilling eyeballs and, oh yeah, electrocuting enemies with eels in a tank. Please don’t try this at home. While Deadpool as a whole is far more hit and miss than the Merc with a Mouth would ever be, its high concept ‘the anti hero forces the developers to make his game’ angle is enough to grant it entry into this list. The fourth wall may as well not exist here as a Nolan North-voiced Deadpool smashes it to pieces repeatedly by using speech bubbles as platforms, noticing when Achievements pop, and even making calls to his own voice actor. As tie-ins go, it’s undoubtedly the weakest of this bunch, but the love of the character is there, and if you’re a fan, there are worse ways to while away the hours waiting for Ryan Reynolds’ cinematic sequel. It might not be easy being green but this open world smashfest makes it easy to feel like the seriously angry model for purple board shorts. A more destructible and insane version of Spider-Man 2, everything in Hulk’s world can be destroyed. Buses can be surfed, aircraft swatted out of the sky like flies and cars tossed through the air to hit missiles. If you can see it, you can do a Miley Cyrus and come in like a green wrecking ball. You might start to see Iron Man’s point when it comes to the Superhero Registration Act in Civil War, but no game has better nailed the utterly destructive feel of Bruce Banner’s monster since. Put X-Men Legends on Marvel amphetamines and you get Ultimate Alliance. Another top-down brawler from Raven Software, this hands over a slew of heroes for you to take on the nefarious Doctor Doom. Sure, it’s just a load more button mashing to take on a stack of goons before fighting a mega boss, but the customisation on offer is huge and creating your very own super team has never been this much fun. Once again you can hop, skip and jump across the Marvel universe, and if you want to team Spidey up with the Avengers before Civil War this year, he’s just a menu selection away. Bet the film studio lawyers wished it were that easy.